American shad have been called the "founding fish." The American shad, called the nation’s “founding fish” because it sustained generations of Native Americans and later European settlers, is facing tough times. There may be cause for hope of a turnaround. Or there may not. The species’ life history, enigmatic still to scientists, makes the future hard to predict. But there’s no question where the fish are now. “Really, if you look up and down the East Coast, yeah, some rivers are doing better than others. But there’s hardly any case where you can say shad are at historic levels. 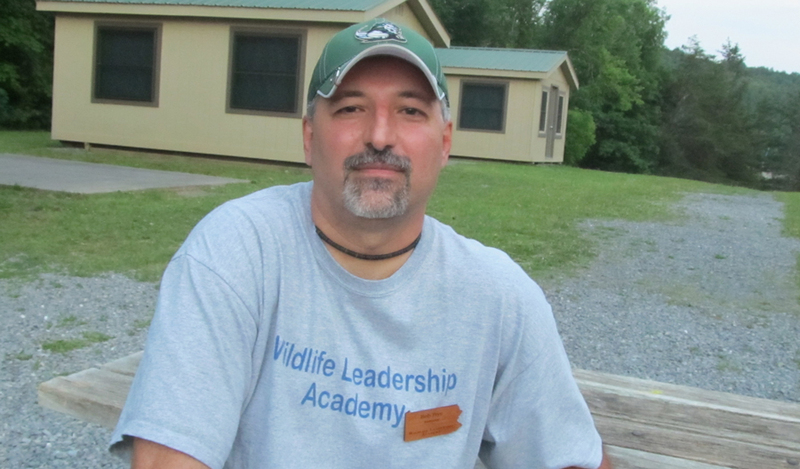 Or at least at levels where we could say, wow, we’ve taken care of whatever issue is going on out there,” said Bob Greenlee, eastern region fisheries manager for the Virginia Department of Game and Inland Fisheries. Shad are an anadromous species, meaning they split their lives between fresh and saltwater. “Larval shad start out their lives in the upper reaches of river systems ranging from Florida north to Newfoundland. As juveniles, they begin the downstream trek to the Atlantic Ocean, where they school and migrate astonishing distances each year to spend their summers in the Canadian Bay of Fundy,” writes Erin Weeks for the South Carolina Department of Natural Resources. In centuries past, they did it on a grand scale. Rivers — the Susquehanna in Pennsylvania, Potomac in Maryland, Rappahannock in Virginia and Santee in South Carolina, to name a few – used to fill with migrating shad each spring. The surge occurred on a magnificent scale, with millions upon millions of fish rushing upstream. Collecting American shad in the Chesapeake Bay. People all over took advantage of the bounty. Even George Washington became a commercial fisherman of sorts, while others turned to murder to claim prime fishing spots. Pollution fouled the rivers. Even more notably, dams sprang up. American shad used to run as far as 450 river miles up the Susquehanna, for example, said Josh Tryninewski, leader of the anadromous fish restoration unit for the Pennsylvania Fish and Boat Commission. Now, they can go only 10 miles upstream before hitting Conowingo Dam, a power-generating facility. Those that get past it via a fish elevator hit three more dams – Holtwood, Safe Harbor and York Haven – within the next 46 miles. The commission’s goal is to get two million shad past the four dams each year. This year, though – partly due to high water, which hurts efforts – just 6,992 fish passed Conowingo. That’s down from 193,574 in 2001 and the fewest since counts began in 1997. And that’s just the start. Only about 3 percent of those fish pass the remaining three dams, on average. “Multiple dams, low in the basin, that’s hard to overcome,” Tryninewski said. American shad face other challenges. One is that they’re a prey species for many mammals and fish. When shad return to their natal rivers to spawn at ages 4 to 6, they’ll be 15 to 20 inches long and 3 to 4 pounds. But when they leave those rivers in mid-fall, just months after hatching, they’re just 3 to 4 inches long. On their path to the sea, and when moving up and down the East Coast following warm water, everything from mammals to other fish prey upon them. No wonder it takes stocking 450 or so to get one adult, as Tryninewski said. Then there’s ocean life. Scientists don’t completely understand what threats the fish face there, be they natural or tied to commercial fishing. But there seem to be plenty. “That ocean is sort of our black bow for those anadromous shad and herring species,” Greenlee said. “When they leave their spawning tributaries as young fish and get out in the ocean, we just don’t really know what happens. State and federal fish and wildlife agencies have long tried to boost shad populations by stocking. The Fish and Boat Commission’s first charge, after being created in 1866, was to figure out how to fix declining shad runs. But results have been mixed. And that’s causing at least some states to examine whether it makes sense to continue. 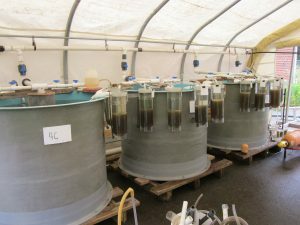 American shad hatcheries, like this one in Massachusetts, are meant to aid in restoration efforts. 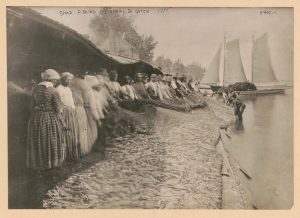 Virginia, for example, this year discontinued efforts to stock shad in the James River. It was having trouble meeting stocking goals, and getting little in the way of recovery. Shad return to the James each year, Greenlee said. That creates some recreation, but no restoration. And in an era of tight budgets, that’s not enough. “If we’d have had a program where we saw any signs of benefits, we would have made other decisions. We would have found somewhere else to get the money. But we just weren’t seeing the outcome we’d hoped when we got into the shad stocking business,” Greenlee said. The Fish and Boat Commission has likewise been debating whether to pull the plug on its shad program. Its Van Dyke Research Station raises between 2 and 5 million shad fry for stocking annually. It’s the “pioneer of shad culture around the country,” according to Brian Wisner, director of the agency’s bureau of hatcheries. But the commission is looking to cut $2 million from its budget starting this month. Closing Van Dyke would save $200,000, so it was on the chopping block. It appears it will survive, though. When the commission board meets next week, executive director John Arway said he’ll advance a proposal to raise money for the agency by creating new fees, and/or increasing existing ones. If his board agrees to those changes, Van Dyke can be saved, he said. Dams like Conowingo operate under federal licenses, Tryninewski noted. They typically last up to 50 years. In decades past, negotiated fish passage goals couldn’t be tweaked between licenses. But moving forward, under the terms of licenses being renewed now, dam owners are required to move certain numbers of fish in a specified time, he said. If they don’t, they must address those problems. That makes it more important than ever to keep stocking shad in rivers like the Susquehanna, said Andy Shiels, director of the commission’s bureau of fisheries. But only if the fish are there in sufficient numbers. “A lot of it also has to do with not having a large enough mass of fish in the rivers, both wild and stocked, to create good year classes that can go out in the ocean for four to six years and then return,” Shiels said. Other states, meanwhile, are sticking with shad, too. The New Jersey Division of Fish and Wildlife is looking to help the species by outright removing obstacles to fish movement. “A flurry of dam removals have taken place along the Raritan, Musconetcong, and Millstone Rivers in recent years, with more on the way, including those along the Paulins Kill,” said the agency. So, despite its hardships, it’s not time to write off American shad just yet. “There’s always cause for hope,” Greenlee said. “We’ve come a long way from the 1970s, when our major rivers were pretty much dead zones. We’ve improved water quality and habitat connectivity. There are rivers like the Potomac that are showing signs of improvement.